I like to see what Timothy draws. He loves drawing and my house is filled with everywhere. He would ask me or papa to pin up his drawings. I must say that he is very creative. Everything he observe he pens it down on paper. Like this picture, do you know where he got the idea from? i don’t know where’s the idea from..but i can roughly guess th purple guy is dancing there. or maybe the little girl is Emily..
mich, the lil gal beside is Emily ? so cute la..
the purple fella kinda remind me of Dr seuss. Yup..that’s from Monster, Inc. He drew Boo pretty well..hehe..
I’m a link on the Technorati Fave Train too! Everyone:I was thinking the same, the picture from Monster Inc, the bad monster. Apparently not. It is a dragon dancing with Emily. It is some ideas put together. He got the dragon from a VCD I got free from Staedtler color pencil. The dancing, he has some aerobic class in the morning for his sports day. Emily, his fav sister…hehehe…if they don’t fight. Hee hee.. I too thought it’s fr Monster Inc.. Very nice drawing.. give him more papwer to draw.. who knows one day he may be come some famous artists.. and all these can be sold for huge amount of $$$$. Tim is good boy compare to Jona….he love drawing but, just insist do it on wall…if you ever come to my house,….it is full of Jona drawing – as decoration….any ideas to change his attitude to draw on paper?? 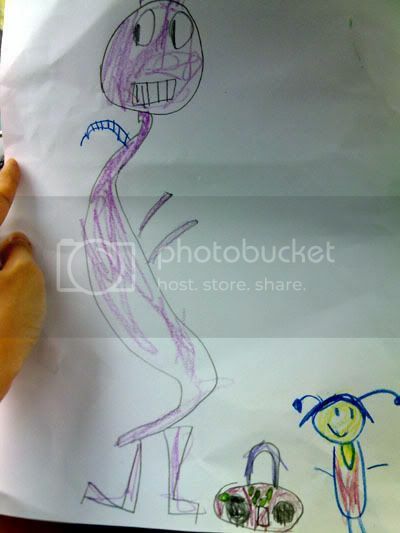 Actually, it looks like a purple monster to me. Purple? Monster?…sounds a little like Barney, no? the beautiful lil girl must be his sister.